Hogeye - Rain and Snow - Didn't he Ramble - Done Gone - The Tenderfoot - Chinquapin / The Puncheon Floor - Methodist Pie - The Baltimore Fire - Sal's Got A Meatskin - Old Reuben - George Collins - Goodbye Miss Liza - Jordan is a Hard Road - Georgia Camp Meeting - Midnight on the Water - Penney's Farm - Blow ye Winds - Fly Around - Mineola Rag - Old Shoes and Leggings - Rattlesnake Mountain - Bound to Ride. Tom Paley has been playing American traditional music in the Old Time style for over half a century. He was already a legendary figure when I first heard him in the mid-'sixties, sharing the honours with Peggy Seeger on the excellent Topic album 'Who's Gonna Shoe Your Pretty Little Foot?' His elegant guitar playing and wry vocals won me over immediately, and I've admired them ever since. 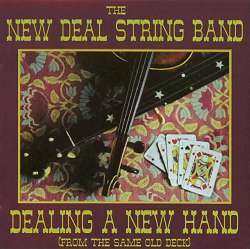 Tom was living in London in 1966 when he formed the first New Deal String Band, as a trio with Joe Locker - another expatriate New Yorker - and three British fiddlers (who played consecutively, not concurrently). After the third fiddler left, there was a long pause before Tom and Joe revived the band in the 1990s, this time with Tom's son Ben wielding the bow. On this CD, the new trio offer several Old Time favourites, derived from respected sources like the Carlisle Brothers, Uncle Dave Macon, and Charlie Poole and the North Carolina Ramblers. They also borrow songs and tunes from the common treasury of anonymous masterpieces we call, for want of a better term, the folk tradition. A few are not, strictly speaking, Old Time pieces at all - for example, there's a New England whaling song, and a Texas rag. But all the ingredients are tastefully blended in the distinctive New Deal style, and served up with gusto and panache. The overall effect is always endearing, though seldom startling - as comfortably familiar as a well-worn and well-loved pair of walking shoes. Like many well-loved and well-worn artefacts, this recording does have its minor imperfections. The fiddles let slip the odd vinegary note, and on a few occasions the voices sound just a little creaky. But tiny glitches are an acceptable price to pay for the freshness and spontaneity of a near-live recording. Certain types of music may be better served by a studio process that begins with a metronomic click-track, continues with a string of performers doing their solitary bits in isolated booths, and ends with a marathon mix to massage every note into perfection. But that approach rarely captures the essence of traditional music. It's far more likely to flourish under the circumstances described in the liner notes here - "three musicians in front of three microphones, upstairs at Joe Locker's house in Surbiton, England, having a good time." Now, anyone who cares to listen to the resulting CD can share the good time with them. In this sort of music, the words 'good' and 'time' are intimately related. The listeners' pleasure depends a lot on the performers selecting the right pace for each piece. According to legend, when a student asked Segovia why he played a particularly difficult guitar transcription at break-neck speed, the maestro replied curtly "Because I can!" Some Bluegrass pickers prosper with a similar philosophy, but Old Time music benefits from the more restrained approach of the New Dealers. They've got plenty of expertise on tap, but it's applied in the service of the tunes and songs themselves, not flaunted for its own sake. Delicate instrumentals like Georgia Camp Meeting and Mineola Rag are played briskly enough, but not hammered along at a WilliamTell / Lone Ranger gallop. Roistering songs like Penny's Farm and Didn't he Ramble are belted out with vigour, but not gabbled into incoherence. On the other hand, ballads of death and disaster like George Collins and The Baltimore Fire don't get slowed down till they become dirges, and are all the more affecting for it. And the band's relaxed, ultra-dry ,delivery brings out the best in lightweight comic pieces like Methodist Pie or Hogeye (a rather different variant of the Hog-eyed Man from the one on Kate Lissauer's new CD). Good taste, and good humour, prevail throughout. Listen to this album while you relax on the front porch in your rocking chair, watching the sun go down behind the hills, and sipping a glass of Jack Daniels (if you're lucky enough to have access to any of those facilities!). It might well encourage you to get out that old guitar (or banjo, or fiddle), and start playing along with a few like-minded neighbours. And that's a pretty good recommendation for any recording of Old Time music. Available from: Wildwood Acoustic, PO Box 12, Carnforth, Lancashire LA5 9PD. Mid-price; running time 73.02.